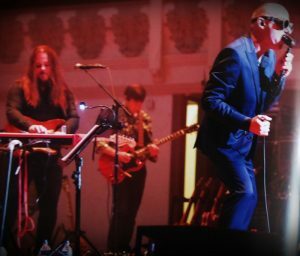 In September 2017 Prog stalwarts Big Big Train played three concerts at London’s Cardogan Hall just of Sloan Square. I was lucky enough to have been one of the passengers on the Saturday presentation of which i enjoyed every minute. 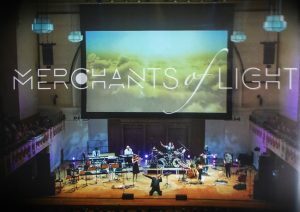 It must have been very gratifying for the band to have luminaries such as Steve Hackett and Tony Banks in the audience as well as current dignitaries of the genre present throughout the performances. Praise indeed. There is no getting away from the fact that Big Big Train major on quality with regards to their music and the way their albums are presented and packaged. I was really pleased when the band announced that recordings of the events were to be preserved for posterity by way of a live album. 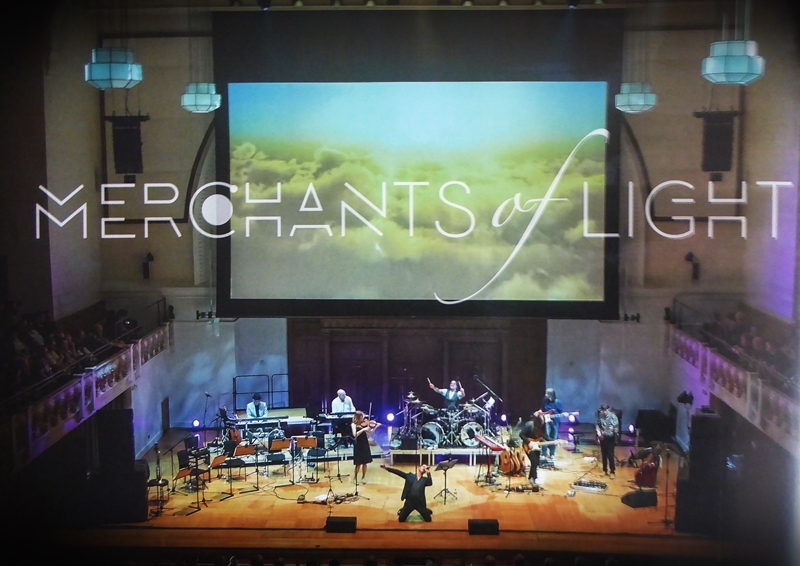 This rather special happening is presented in the splendid Merchants Of Light. 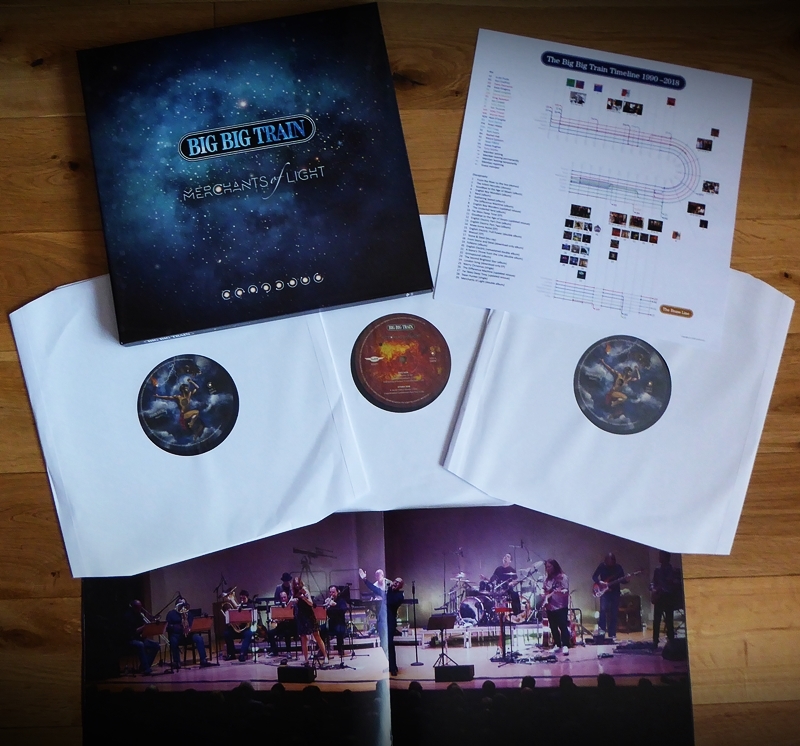 exuding quality in the usual manner the album is exquisitely presented as a two Cd box set with a 72 page booklet and a triple vinyl LP box set with an equally impressive 12″x 12″ booklet, a big Big Train timeline from 1990 – 2018 which should keep you entertained and three heavy vinyl LP records. Reviewed here is the vinyl album box set retailing from Burning Shed for £49 plus shipping. Fortunately the package comes with a digital download key which i found helpful throughout the review process. Sitting down with a cuppa i was instantly transported back to the Cardogan Hall and experienced the excitement welling up within when i heard the firs few bars of Folklore Overture a pre-recorded version allowing the band to access the stage with a little grandeur. Counting out time with his sticks drummer Nick D’ Virgilio commenced the evening proper with Folklore itself. A fitting opener methinks as can be heard by the crowd appreciation. David Longdon appears a little more comfortable in his own skin as front man on this occasion than the previous live outings at King’s Place. More confident in his delivery no time is spared before launching into Brave Captain which i considered to be a pace setter. Plain to hear that the band as a whole are much more cohesive especially when there is so many elements o the music. One of the highlights for me personally is Last Train from the 2009 The Underfall Yard album. It is only now that i appreciate the wealth of the bans talents hearing the acoustic guitar unison and vocal harmonies played by guitar legend Dave Gregory and Rikard Sjoblom ably abetted by Rachel Hall’s sweet backing vocal and violin. Rachel’s energetic performance stands out throughout the whole show adding a great vibe. Flute and Hammond sound gives this piece that distinctive early Genesis sound and guaranteed to put a smile on the faces of many. The choices of songs and running order have obviously been thought about long and hard as the show and therefore the album flows beautifully. Evident by slowing the pace down a little with London Plane which benefits from Dave Gregory’s deft touch nailing the lazy guitar break before ramping up the ante in Mead hall In Winter. Here Rikard Sjoblom excels with a performance that between he and drummer Nick D’ Virgilio had me confused as to whether i should be playing air guitar or drums. I consider this to be a stand out song possessing a great formula and a sterling performance. The hook line of the chorus had me singing along in in unison without any chemical or alcohol assistance. Between it’s uplifting lyrical content and fine contribution from the brass section Mead Hall In Winter painted a massive picture. Elsewhere on the album there are some fine and special moments none more so than Swan Hunter. Beautifully written by Greg Spawton and DavId Longdon, Mr Spawton adds a fair bit of heft here and throughout the whole performance with his bass and bass pedals. Missing here are the visuals which on the evening caused a few lumps to appear in the throats of some of the audience. One thing that David Longdon doesn’t shy away from was reaching those high notes which he does here with aplomb, receiving a well earned applause immediately having done so. Indeed i very nearly lost the plot and raised myself for a standing ovation. Not good when you are in the house on your own! The brass section really adding to the mood of the piece which in a Peter Skellern type way is quite a sad one. Another song which has now become a live Big Big Train standard is East Coast Racer which could well be be my favourite BBT song. It has everything within it that the band can offer. From Danny Manner’s haunting piano intro through the pace and urgency invoked throughout with the vision of the steam train hurling across the viaduct firmly planted in the listeners head to Danny Manners gently lowering it back to earth again. The album is worth buying for this alone. To conclude the album Nick D’ Virgilio returns to the stage the band having left and positioned himself at his kit. Over an electronic drum pattern Nick plays a powerful drum piece whilst introducing the members of the brass section. A nice touch. As the brass section strike up some recognizable chords the band return to perform a rousing and uplifting Wassail which once again is delivered with aplomb and a fitting end to a great evenings music. In fact musically and as far as a live performance goes it’s up there with the best i have attended. Sadly it was to be the last performance with founding member Andy Poole adding to the kudos of the album. However, there are one or two observations i have to make and risk being out of kilter with fellow passengers. Firstly, i felt the show on the evening i attended seemed under amplified considering the size of the Cardogan hall. I am not the only person to have made this observation as i overheard numerous attendees voice the same opinion. This is reflected in the mix which i would say is a true representation of the sound. Drums sound slightly recessed on full range loudspeakers yet more dynamic via headphones. The digital download files did improve the balance with higher frequencies though the smoother sound of vinyl had more weight especially with kick drum and bass pedals. Neither of these observations detract from the overall experience which is in my view excellent. To make the album a more authentic document i would have appreciated David Longdon’s introductions and audience interaction be included, though i suspect the band have their reasons for their exclusion. 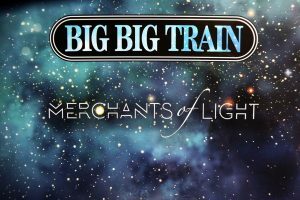 For Big Big Train completists Merchants Of Light is a must yet serves as a brilliant showcase for new fans to discover their broad musical palette.